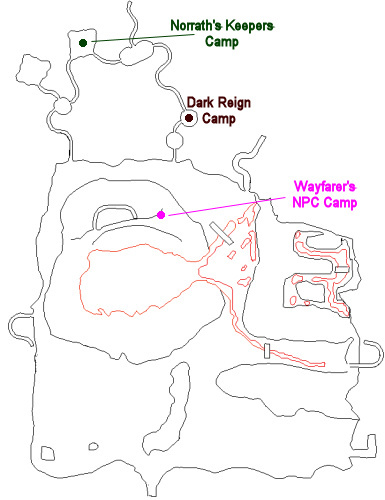 This solo task begins with Private Nylaen Kel`Ther (click for map image) who may be found at the Norrath's Keepers camp in the caves of the Lavastorm Mountains (/loc 3750, 470). You have been assigned the task 'Burning Arrows'. This quest is marked repeatable, but it does not seem to be. I have the task, but I do not know how to get to the proper place to kill the goblins. I do not have a target on my compass leading me anywhere. Any help in finding these foul goblins would be helpful. go to lavaspinners lair head straight in and you will zone into tirr's delve (its a little way into zone). you zone into a small tunnel that has no roamers i'm aware of go about 40 feet into tunnnel and it will come out into a cavern with drakes then unto a wall lined with the gobs you need. one version see's invis think its gob invoker but cant remember. getting a drake faction solo task from alliance camp is not a bad idea as your going to have to kill a few to get the gobs w/ out adds. the caster versions like to gate if i remember correctly. do all goblins in this TD zone drop the tooth? i only killed 3 and ran out of time and they all had nothing.